School bags must be firm, sturdy and a dark colour (navy, black, brown or maroon). 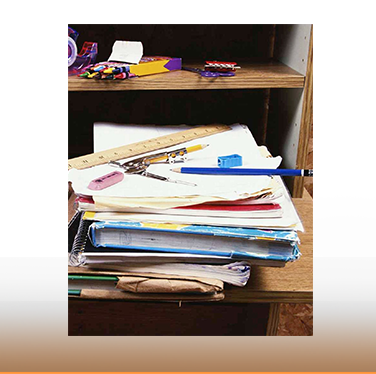 There must be compartments that offer adequate space so that text books and exercise books can be comfortably packed without damaging the said items. No stickers or graffiti allowed on school bags. No trolley bags, sling bags or kitbags allowed. All learners are issued with a blue Media bag. Media books will not be allowed to be taken out without the Media bag. type or colour are allowed. All learners are to dress properly during and after physical education lessons at school. Cloakrooms must be left clean and tidy at all times. Note: Boys may not wear earrings or studs, neck chains or any arm decorations at all. Under no circumstances may any form of body piercing jewellery be worn to school. 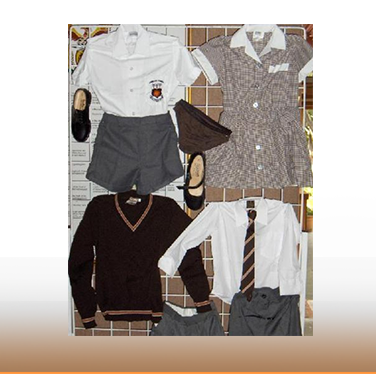 No T-shirts, sweat shirts or jerseys to be worn under school uniform (shirt/dress). Long hair (shoulder length or longer) must be tied back. Only 1 or 2 plaits and ponytails allowed..
Plaiting/braiding must lie flat against the head. If hair is straightened and begins to grow, it must be put into a pony tail. If hair is straightened, it must be held down with moisturizer, not gel or glycerine. Hair can also be held in place with a brown, orange or white Alice band. No wide material head bands are allowed. Only plain brown, black, white or orange ribbons, bobbles or elastic bands are allowed (no mixed colours). No colouring or gel is allowed. Fringes shall be well above their eyebrows. Hair shall be neatly cut as not to hang over their collars or ears. Sideburns shall be cut short. Steps and undercuts will not be allowed. No shaved heads or hair shaved up the head and a patch left on top. Brush cuts to be No. 4 only. No colouring or gel is allowed - brown or maroon).